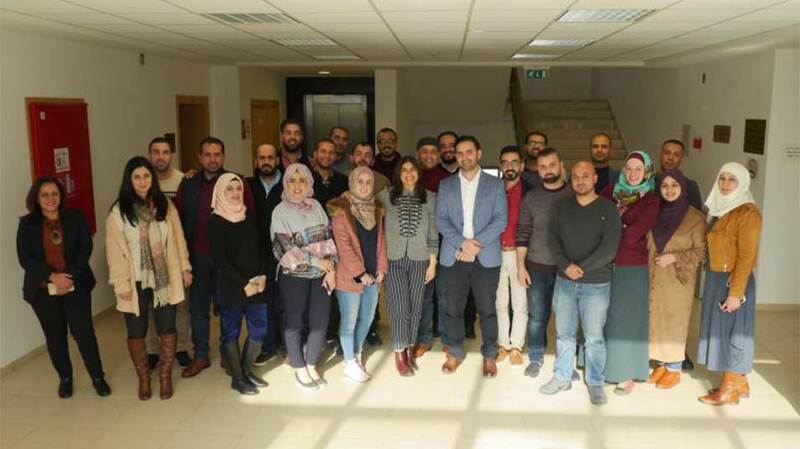 The Media Development Center at Birzeit University concluded a four-day training course, held in cooperation with Al Jazeera Media Institute, entitled “Social Platforms Data Analysis” on February 20, 2018. Held in the Mohammad Masrouji Building for Media on the university campus, the course was attended by twenty data analysis and digital marketing specialists in public relations and social media, as well as stakeholders and social media activists. The course, led by digital strategy expert and Al Jazeera social segment presenter Hamda Kochtali, aimed to develop the skills of participants in social media platform utilization and identify the role of research and development in improving employees’ performance. The course reviewed performance indicators and data collection and analysis tools and explored social media platform analysis standards, which include general standards, technical and format standards, and editorial standards. Additionally, the course presented a case study on Al Jazeera channel and included a number of exercises and activities. On the last day of the course, a competition was held in which participants divided themselves into four groups, each of which compared a number of similarly-themed pages on social media platforms. The groups analyzed the pages and presented their recommendations on improving the pages’ performance based on the resulting data. The groups analyzed a variety of political, sports, musical, and educational pages, with the winning team awarded a prize by Al Jazeera and the Media Development Center. MDC course coordinator Yasmine Misk noted that the course, partially funded by the Swedish International Development Cooperation Agency (Sida), is part of the center’s goals to build the capacities of Palestinian journalists and improve their skills and knowledge, leading to the production of high-quality media content that suits the needs and demands of the market.